I know I should start by suggesting unplugging and/or having a digital detox, but I'm actually turning my back on that idea. Just a little bit. Speaking from experience, a sudden and total digital detox tends to cause more worry than the stuff itself, y'know? My suggestion would be to restrict; allocate a brief moment to do what you (think you) have to do and then detox - allowing you to truly relax, with nothing hanging over you. Noting the pile of pastries below, now might also be a good time to mention how gentle mornings are ALL about the food. It's Autumn, it's cold and it's time to treat yourself. Bring out the pancakes! Okay, moving on to the widespread favourites. Fur throws and fleece blankets are a must and it doesn't hurt to have a magazine to hand, for that early morning inspiration. Muffled soft music can also add to the ambience, drifting in from another room. I've currently got my eye on the new Panasonic CD speakers that function as multi-room speakers for CD, radio and smartphone - something that's shot to the top of my wishlist since rediscovering an old Britney CD of her greatest hits (don't lie, you love her too). 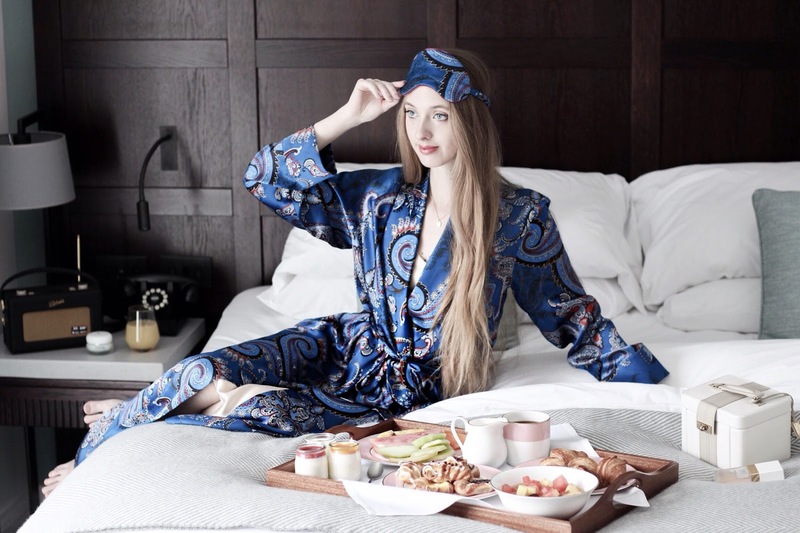 Oh and needless to say, I'm a huge fan of luxurious nightwear and loungewear; with Bonsoir of London quickly becoming one of my favourite go-to brands for those special finds (see Luxe Getaway | 6 Ways To Indulge from this past summer) - scroll down for details on this silk and paisley look! This cosy time of year absolutely calls for gentle mornings spent indoors! So let me know, have I missed anything off this weekend morning checklist? 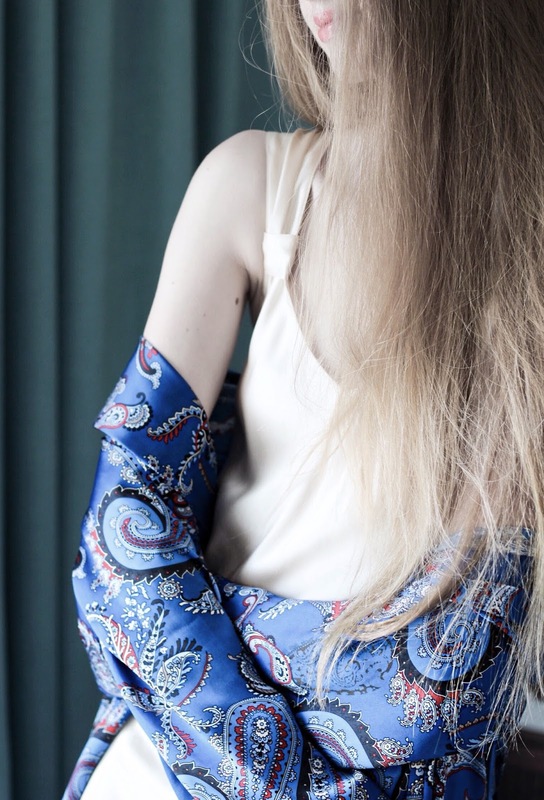 I'd love to hear about how you're embracing Autumn right now, as well as your thoughts on this dreamy silk paisley gown from Bonsoir of London's new Autumn collection?! love your pajamas!!!! So pretty!!!!!! The colors are pretty! 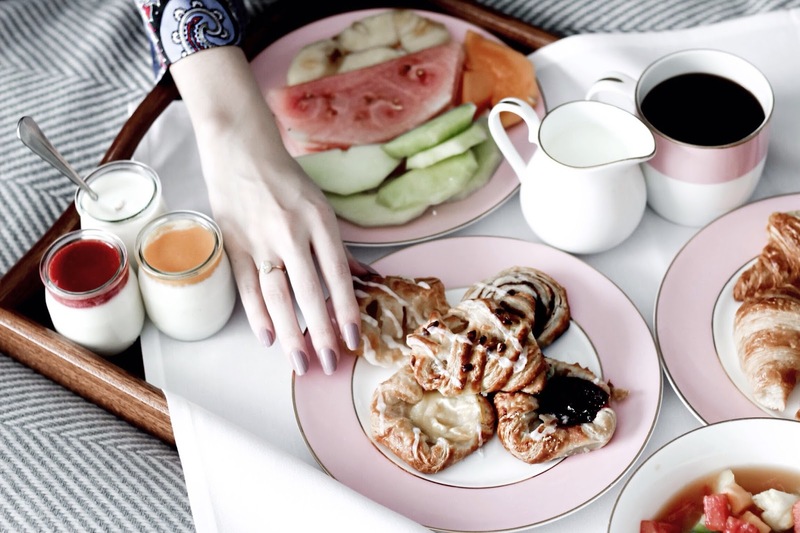 Your morning sounds so amazing – and what a gorgeous breakfast! those pastries and fruit salads look delicious. true, we all need to take care of ourselves and some chilled relax/pampering time is absolutely necessary. That gown is STUNNING. It looks like it feels like a dream. I've been worried about not totally embracing this time of year as well, but all we can really do is take moments to ourselves, like you said. A gentle weekend sounds so appealing right now. I think I'll so just that! That print is amazing and your shooting is beautiful as always!!! A really good work Gabrielle!!! I bought my first fleece blanket two months ago and I am hooked so now I want to buy every single one that I see. And talking about digital detox, I desperately need one. I know I will probably go crazy worrying about engagement and stats but I am feeling so burned out. Ohhh love your kimono, so pretty! This is really an art! Not all people are able to spend mornings enjoying them. Wow! These photos are so GORGEOUS! Your stay looked amazing! And I am in looove with your robe! Your robe is beautiful Gabrielle! I'm all for comfort all year round and while I agree that a sudden total digital detox can be anxiety inducing, when it becomes a regular practice, it's like the most refreshing break. Relaxing mornings spent enjoying the season are always the best! Indulgent food and comfortable clothes can make for the perfect weekend! These photos are amazing and yes to pancakes and treating yourself this time of year! I live for fleece blankets. This is what I love about your blog, celebrating simple things in life in style. 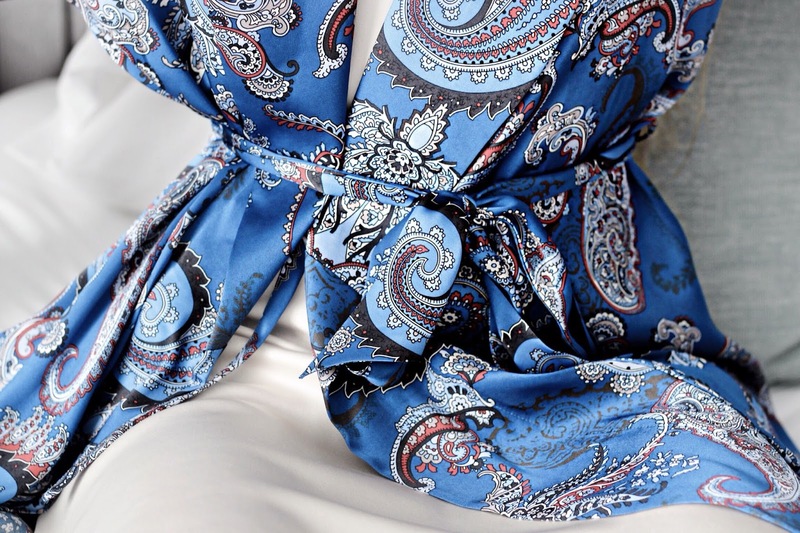 Love the gentle mornings idea and of course your paisley night gown. So beautiful dear! Che bella! É bello cominciare con un ottima e ricca colazione. You’re almost making me jealous for colder weather with all that take of comfort & food. Pancakes?! Yes please! Loving you gown! It’s so classy! ahhh a gentle morning is all that we need! 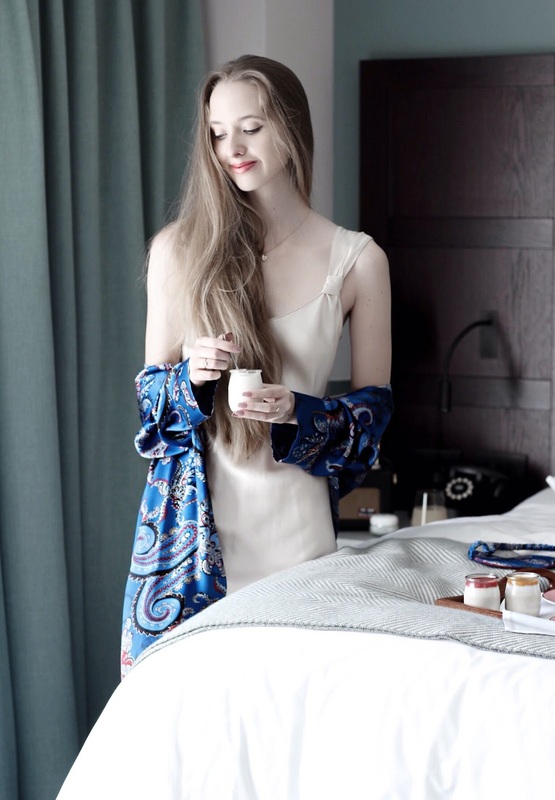 Love your silk robe and your photos are so aesthetically pleasing! Adore lingerie, I literally love silk lingerie and those prints are just amazing. Plus, you look amazing in them. Pretty impressed by the nice breakfast too .. This period I haven't been able to unwind so much but usually once a month or less I like to spend a day on the couch and read a book from beginning to ending. I don't read often but when I do I want to finish it also. Great post, beauty! Thanks for the inspiration, and have a greta start to the weekend! Oh looking like a super comfy night gown! and as always love your photographs! First of all, you look so chic and cozy in all of these shots! And also, I love slow (gentle) mornings. We seem to always be rushing but there really is something special about slowing down to enjoy the little things before your day gets going. Love the blue sleepwear! You look fantastic lady! You really do! My favorite morning! Amazing photos! This sounds like a wonderful morning, and I'm loving all these beautiful photos that set such a peaceful mood! The food looks super delicious. Really lovely photo's! Very serene haha. Loving this gentle and relaxed morning Gabrielle!! Those pastries look so delicious and the silk gown seems to be the softest piece you could ever wear! Also the color looks beautiful! This is such a beautiful dressing gown and I love the eye mask too. Perfect for a cosy weekend relaxing at home! This silk nightdress looks amazing on you. The perfect look for a cozy evening at home. Oh yes! 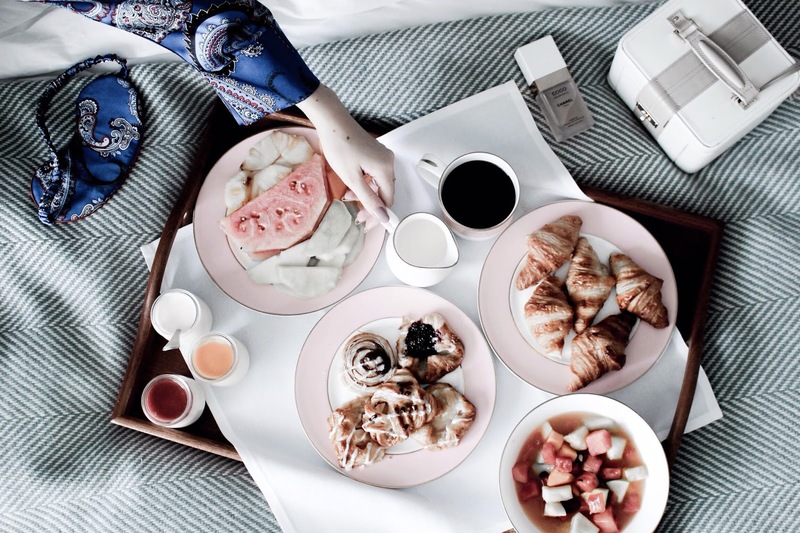 Breakfast, a cozy bed and Silk pajamas are my kind of mornings! Your silk gown is absolutely stunning - I love the bright pattern. 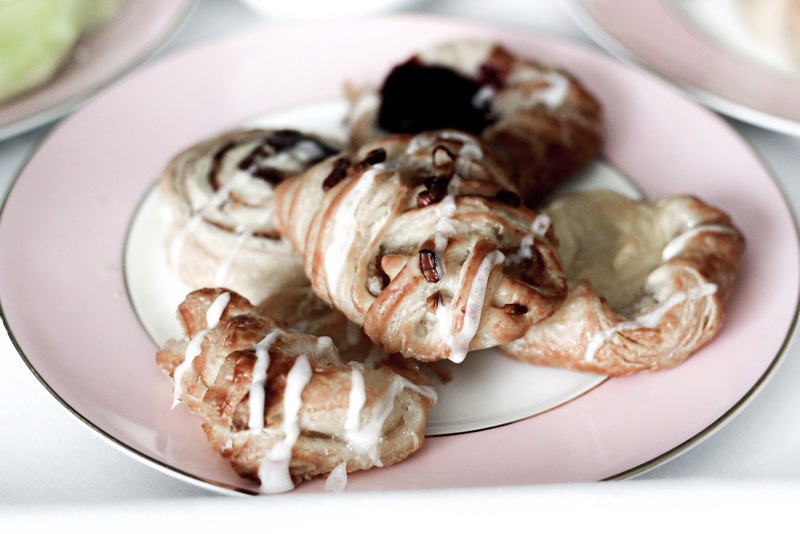 Great ideas for a cozy morning - the food looks amazing! Since this is my first proper year with a serious winter coming I'm still trying to hold on to every sunny day we've had, but I know the time is really coming to try and stay cosy and embrace the cooler months. So I've been scouring the shops for cosy knitwear and I'm planning on picking up a few lovely candles because I love having them on hand and they made a night in so much cosier. Ohhhh this post just gave me ALL of the cozy holiday feels! There's honestly nothing better than warm fuzzy blankets, scented candles, and just feeling WARM! That spread looks to die for too. So in love with this season! I love that silk nightgown, I'd love something so fancy. At the moment I have my cosy dressing gowns but they look a bit frumpy, haha! :) This sounds like a lovely relaxing way to spend the weekend too. I can't even remember the last time I had breakfast in bed, it may have been when I was pregnant with my eldest boy, years ago now, ha! Oh wow every time I read your blog you are looking more glamorous! Loving the silk gown. Ah! The food looks really appetizing! Nom Nom Nom! :) Hope you are having a great weekend! Wow girl, how elegant do you look!? You're also so right about Autumn being ALLLL about the food - cosying up with a plate of croissants in paisley and silk is my ideal morning! I love your robe Gabrielle! It's so pretty. Love the fresh fruit & pastries. Yum! I am all about a slow and steady morning - where possible anyway! You're completely right about this time of year everyone slowing down and being a lot kinder to themselves, something I can most definitely get behind! And beautiful sleepwear is a great place to start for sure! sounds like a very relaxing way to spend the morning, and I just adore those night gowns! You're making me hungry with those beautiful looking pastries!!!! I love the blue colour and the details on that dressing gown. It's screaming opulence! That silk night dress is sooo gorgeous. Looks perfect on you dear. I've been away for work and I'm just now catching up with your blog, you just look amazing in everything you wear babe! The peignoir looks so silky and smooth, I want it too!! And you make me want more dreamy hotel nights, and mornings of course! What a wonderful way to spend a morning! 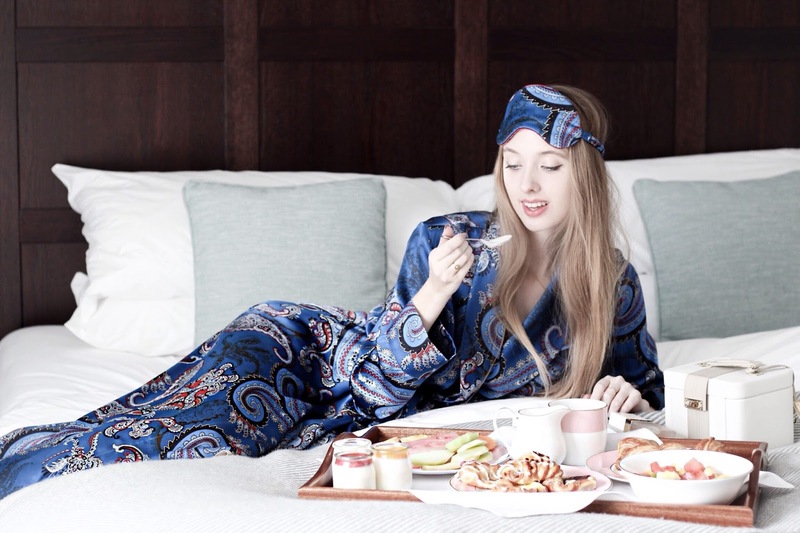 That yummy breakfast in a beautiful robe - love it! Your own is definitely a dream and I want to have your breakfast right now (but I know I should stop blogging and instead cooking a dinner). I love this season, too, and honestly, I never thought about digital detox :) I like it to be connected! Enjoy further fall and thanks for the beautiful post. 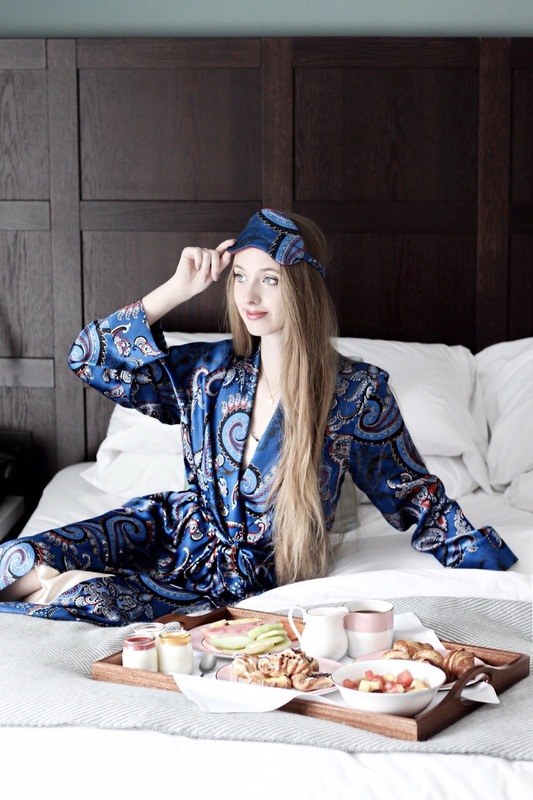 What a beautiful post Gabrielle and how luxurious are your PJ's from Bonsoir, you look stunning and relaxing in style is certainly a wonderful thing to do. This time of year when it starts to get a little colder really is a perfect excuse to cosy in and pamper yourself, and totally agreed, bring out the pancakes -all year every year! Sending love and thanks for sharing such a gorgeous post! That is such a pretty robe! Gorgeous photos! Aw...Great post and you look awesome! I'm feeling this gown I have recently had few silk 1s sent to me from lovely brand and they are sexxxx but still love my granny fluffy one for winter lol. Thank you for sharing this with us love. Wishing you a happy November. Kisses, Dominica from London.